The Finny Slam Fishing Tournament was held March 10, 2019 at Pere Marquette Expeditions in Ludington. Opening at 5:30am, with the tournament starting at 7am. All DNR rules apply, and you can fish any Michigan lake. Here were the winners of the 2019 Finny Slam! Congratulations to the winners of Finny Slam 2019 Ray Finholm memorial tournament, each receiving $116. Donnie Darby with a 11 5/16" Perch, Kasha Clark with a 33 5/16" Pike and Zach Malott with a 34 3/4" Steelhead. 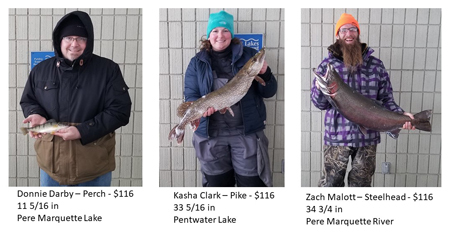 Several nice fish were caught Sunday, March 10, 2019. Entrants saw a bit of sunshine early in the day but the wind was a bitter reminder it is still winter. Pere Marquette Expeditions gift certificate winners were: Todd Butler and Aric Miller. Prize includes a 100% payout for the longest fish in each category: Pike, Steelhead and Perch. You must be in line for measuring by 6pm. The $10 entry fee includes sloppy joes down by the river at Sutton's Landing following the tournament.